When the foot is forcefully externally rotated fracture rupture of ligaments of the ankle or fracture of their attachments to bone may occur. If the foot is supinated the lateral structures will break first as they are in tension. If the lateral structures are relaxed because the foot being pronated the medial structures will fail first. Patients seldom remember the position their foot was in when it was injured. For this reason the Weber classification is more practical. Intact (as well as the anterior tib fib ligament - this is why the fracture of the fibula begins here. The lateral side is last to rupture. If this ligament holds and the fibula fractures at this stress raiser higher disruptions such as the interosseous ligament cannot take place. If the displacing forces are insufficient only partial progression to the full blown cases above will occur. E.g. An isolated lateral malleolus fracture may be an incomplete Weber A , but it could also be a occult Weber B or C where the only bony fracture is of the distal fibula. Check for tenderness of the medial malleolus to test if the deltoid ligament is ruptured. If the fracture starts at the ankle and runs proximal to the joint it is a Weber B, if the fracture of the fibula is above the syndesmosis the fracture is classified as Weber C.
Weber c: fractures are also known as the Dupytren's fracture. A high fibula fracture (near the fibular neck) is known as a Maisonneuve fracture. Always examine the ankle when you see a spiral fracture of the fibular neck. Tenderness of the medial malleolus may mean a rupture of the deltoid ligament, even if the x rays appear normal. A stress x ray of the ankle may be needed under general anaesthetic to demonstrate the disruption of the syndesmosis. If the hind foot shows obvious mal alignment reduce the ankle even before taking X rays. A rough reduction can be accomplished simply by grasping the heel, and reducing the posterior subluxation, and then reducing the varus or valgus mal alignment. Early reduction is important in preventing complications such as gross swelling and fracture blisters, which will prevent early internal fixation. The casualty officer must ensure that all ankle fractures are grossly reduced, even if he intends referring the patient elsewhere for definitive treatment. An accurate reduction of under 2 mm displacement id difficult to achieve and for this reason most bimalleolar and displaced fractures will need internal fixation. AP, Lateral and Mortise views are required. Candidates for closed reduction are ankle fractures that can be reduced to less than 2 mm of anatomical position. This can be achieved with minimally displaced isolated lateral or medial malleolar fractures, but is difficult with most bi malleolar cases. The fracture is manipulated under adequate analgesia or general anaesthetic. A below knee plaster cast is applied with the foot in the opposite position as the initial displacing force to relax ruptured ligaments and close the fracture. Most displaced fractures will require surgery. If your hospital does not have the expertise or facilities to do open reduction and internal fixation. Reduce the fracture, and place the limb in a back slab to stabilise before referral. The ideal time for Open Reduction and Internal Fixation (ORIF) is immediately but, if there is significant swelling operation must be delayed until swelling subsides in a few days. Fracture blisters are a contraindication to surgery. Open fractures ( the ankle subcutaneous and these injuries are common) are debrided reduced and definitive ORIF is done at 48 hours, or whenever the wounds are deemed sterile enough to close the skin. The medial malleolus needs to be fixed with one or two screws. 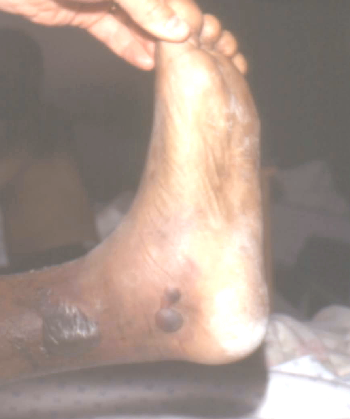 The lateral malleolus is usually shortened and or displaced laterally. Once the fibula is pulled out length and the fracture reduced a plate and screws are used to stabilise it. In Weber C fractures the syndesmosis is stabiles ed by a "syndesmosis" screw between the plate on the lateral side and the outer cortex of the fibula. It is placed about 1.5 cm above the ankle joint. Dislocations of the ankle are often open. It is unusual to get a dislocation without a fracture of one or both malleoli. Reduce and treat as an open ankle fracture with debridement and secondary ORIF. Late onset of osteoarthritis is rare if the ankle is reduced satisfactorily. Osteochondral damage such as seen often in a Weber A fracture carries a poorer prognosis.